The Gwinnett County Board of Commissioners gave citizens an early Christmas gift this week by authorizing the execution of new eight-year hauler agreements for solid waste. The agreements, which are for residential trash collection and disposal and residential recycling collection, will be made with the five waste haulers that currently serve Gwinnett County: Advanced Disposal, Republic Services, Sanitation Solutions, Southern Sanitation, and Waste Pro. The new agreements begin July 1, 2018 and will run for an eight-year term through June 30, 2026, with the option of renewing for an additional two-year term. Residents will keep the same hauler they currently have. Now onto the great part about this news: Costs are decreasing and recycling will get an upgrade! The haulers have agreed to a 7% reduction in contractor fee beginning July 1, which will lower residents’ monthly fees to $17.91. The 17-gallon recycling bins that we currently use, which for many families are not large enough to store all of the recyclables their household generates in a week — will be replaced by 65-gallon wheeled carts. Cart lids will protect materials from blowing away and becoming litter or getting contaminated by the elements. Though these carts are not as large as the 95-gallon carts for trash, they’ll provide room for plenty of recycling. In addition, haulers have agreed to increase the senior discount from 15% to 25% starting July 1, reducing the fees seniors pay for solid waste services from $16.47 to $13.75 per month. This discount is currently a county obligation and but will become a hauler obligation. There will also be a 25% reduction in the fee for yard trimming collections service for residents who choose a 12-month contract. The new plans will only affect residents in unincorporated Gwinnett, not cities. Residential trash and recycling service will still include weekly trash pickup of household waste and more than 30 types of recyclables. Collection on each street will be on the same day of the week with exceptions for New Year’s Day, Thanksgiving Day, and Christmas Day. Service will continue to include bulky item and white goods pickup. The motion passed at the Gwinnett County Board of Commissioners’ business meeting on December 19 with a 4-1 vote. District 3 Commissioner Tommy Hunter voted against the measure but did not provide comment. District 4 Commissioner John Heard thanked County Administrator Glenn Stephens for his efforts in reaching the agreement, waste haulers for serving our community, and citizens for their patience as these changes were developed. You can watch footage of the public meeting on Gwinnett County’s website or read the county’s press release here. This is a great ending to 2017! EDIT: It was announced on June 5, 2018 that the new hauler agreements also include the removal of glass from the Gwinnett County recycling program. Check out our article for information about this change and what Gwinnett needs to do next to ensure that glass can still be conveniently recycled. 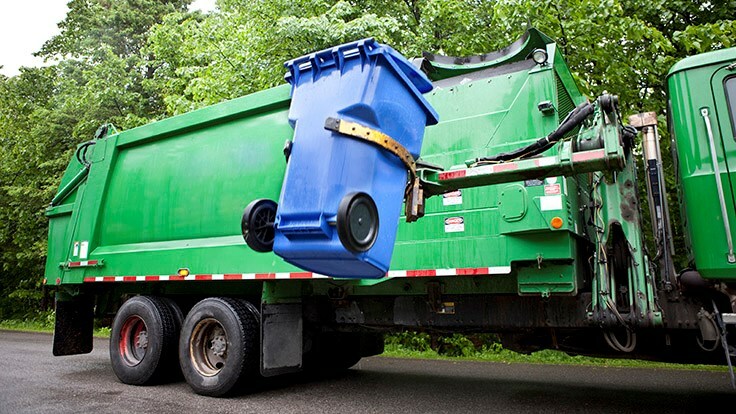 Photo courtesy of Recycling Today; does not depict a Gwinnett County recycling cart or truck. will recyclables continue to be picked up weekly? our bin is sufficient for our weekly recyclebles. Hi Joanna, yes they will. You don’t have to request a roll cart if your bin is sufficient. Let us or Gwinnett County Solid Waste know if you have any other questions!